You’re not going to believe us when we tell you this, but you can get everything you need to know about V-MODA by taking one look at their warranty program. See, they don’t call it a warranty. They call it the Immortal Life Guarantee. Isn’t that fabulous? Isn’t that just the most delightful thing you’ve ever heard? And while we didn’t spend enough time with the Crossfade 2 Wireless headphones to invoke the guarantee, we still got a sense of just how wonderfully over-the-top the cans could be. In this review, we break down their design, comfort and fit, sound, packaging and accessories, specs and more, as well as how they compare to other models. You can also check out our video review. We don’t use that word fabulous by accident. 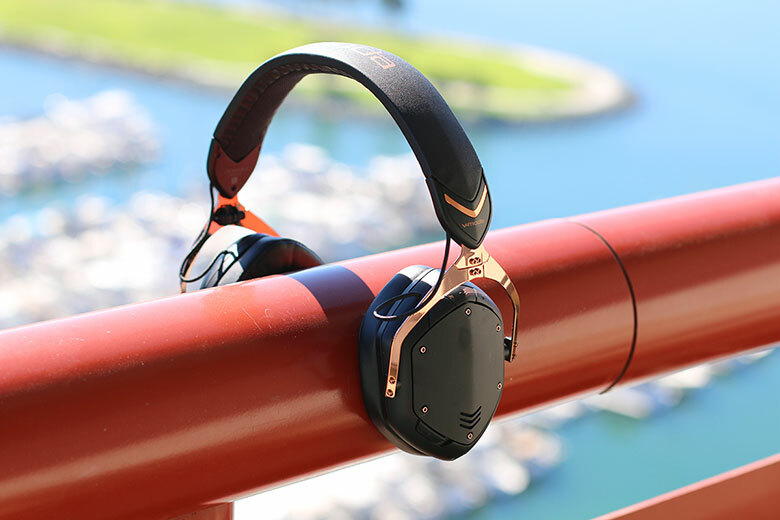 If there was one adjective that described the V-MODA Crossfade 2 Wireless, it would be that one. Either that, or fancy. Fancy is good. They look absolutely splendid, the kind of thing that might have been ripped from a particularly high end fashion show in Milan. You know the kind we’re talking about, with the clothes and outfits that no one in their right minds would actually wear. And while we’d certainly recommend wearing these – in terms of design, they look and feel excellent – there’s a certain frothiness about them, a feeling that the Italian-designed V-MODA wants to stand out from the crowd. Compare this to the stodgy German perfection of something like the Sennheiser PXC550 (full review here), and it’s easy to see the difference. These are not a pair of headphones that one wears. These are a pair of headphones that one displays. V-MODA have always had a slightly military aesthetic in their design, and this pair of wireless headphones comes from that same DNA. The hexagonal outer shells on the housing recall army gear, but the carefully-shaped metal hinges and comfortable, leather-wrapped headband, accented by triangular logos at each hinge, are pure catwalk. The inner cups are memory foam, and we’ll talk a little bit more about this in a few paragraphs. The best bit, however, is what you get depending on the color you pick. Opt for the standard black or white versions, and you’ll have to make do with standard Bluetooth transmission; if you want to experience high resolution aptX Bluetooth, you’ll need to invest in a pair of rose gold headphones. Essentially, V-MODA is saying that if you want the latest technology, you have to be into vibe as much as they are. It’s not an approach we recommend for most headphone manufacturers – especially since rose gold is a bloody silly color – but there’s no denying that the company has serious cojones. In a way, the design is something of a paradox. It works well, looks good, feels suitably luxurious. But it also feels like it’s trying way, way too hard. The company really leans into the Italian fashion angle, touting these as a pair of luxury goods – something that is laughable compared to the myriad more expensive headphones on the market, which come with far less pretensions but design that is more recognisably high-end. We did, however, appreciate just how robust the headphones were. The headband flexes nicely, refusing to break even when twisted into an almost-spiral, and the metal hinges are solid and strong. The headphones are entirely portable, the cups folding inwards with a pleasing click, although you will have to push quite hard, and make sure that you don’t catch your fingers in the hinge when you do so. This is perhaps the most visible difference between these headphones and their predecessor: the original Crossfades didn’t actually fold up. Of course, V-MODA being V-MODA, even the folding mechanism has a cute name: Cliqfold. Actually, if we’re being honest, that’s a little bit too cute, verging on cringeworthy. We do wish headphone companies wouldn’t do this: give internal headphone functions their own names. It was embarrassing when the Phiaton BT-460 (full review here) called its wired mode Everplay:X, and this Cliqfold makes us feel the same way. There are a few design glitches here and there, showing the perhaps a little bit too much thought was given to form, and not quite enough to function. The controls for the headphones are on the top edge of the right ear: a trio of rubbery buttons that perform as advertised, but are hard to find immediately without looking. They also don’t feel quite as responsive as the controls on other headphones. It’s bizarre, because the set of controls on the opposite ear-cup – a springy switch which turns the headphones on and off, and which activates Bluetooth pairing – works very well. Charging is by micro-USB cab…sorry, V-MICRO USB cable, which is fine, although it would be nice to see more headphone makers adopting USB-C, which tends to be the standard in the rest of the tech world. We managed to get a respectable nine hours of battery life out of the headphones, listening around 60-70% volume, and they charged quite happily over about three hours. We do need to emphasise that we did like the design. Overall, it works. Whether you feel the same way will be determined by how you feel about the amount of marketing and attention to image that has gone into these. One thing the headphones do unequivocally get right: the fit. While far from the most comfortable headphones we’ve ever tested – that honor goes to the still-unsurpassed Beyerdynamic Amiron Home (full review here) – they managed to combine pinpoint clamping pressure with some very comfortable pads. The memory foam is squashy and comfortable, and we had no problem wearing these for long periods of time. While we have read other reviews that said the comfort was suboptimal, we disagree with this; for the most part, these headphones did a very good job. It also helps that they are relatively light, coming in at around 11oz. Not bad at all. The pads are another one of the differences between this model and its predecessor, and it’s clear that the team at V-MODA put a lot of thought into. It’s something that really paid off. Had you going there, didn’t we? The sound of these headphones is the polar opposite of neutral. The company may be trying to tout these as a luxury good, but the audio quality is about as far from audiophile perfection as you can get. Believe or not, we don’t mean that as a criticism. At least these headphones know exactly what they’re about, and what they intend to do. They are fun: unashamed, frothy cocktail fun. They will charm the pants off you. The initial impression is of a dominant low end. Not overly dominant – we are not talking Beats By Dre here – just present, pushed to the forefront. The 50mm dual-diaphragm driver – ironically, one of the few things on the headphone that doesn’t have a cutesy name attached to it, showing perhaps the calming presence of the engineering department – managers to separate the frequencies very well indeed, meaning that the base that comes out of these is clear, rounded, and impactful, without ever becoming harsh or fatiguing. It definitely doesn’t present the music in the most neutral or accurate light, but then again, if you buy these because you want accurate sound, you need your head examined. In a way, they reminded us of another pair of fashion-friendly headphones, albeit one that was slightly more elegant in its presentation: the MEZE 99 Classics (full review here). Those headphones, too, emphasise the bass, and while the effect isn’t nearly as clean here, the sound signatures do have similarities. This kind of thing, if done well, and worked on by competent audio engineers, can be an absolute joy. That’s definitely the case here. The other aspects of the sound of fine, if unspectacular. Mids and highs feel nicely filled out, with a good level of detail – nothing on more high-end headphones, but definitely not taking anything off the table. There’s a decent soundstage here, with good spread. Something we particularly liked: despite the pumped bass, we felt that the headphones switched between genres quite well, able to handle everything from hip-hop and soul to classical and metal. We never felt like these were headphones for just one particular type of music, as we might do with brands like Grado. Call quality, by the way, was absolutely fine when we tested it. It’s actually quite reassuring to see how well the sound dovetails with the design, in the sense that they both lean into the frothy, over-the-top vibe that V-MODA are putting out. Ironically for a pair of headphones that seem to, on occasion, be trying way too hard, they absolutely don’t have an identity crisis in terms of their sound. They want you to have fun, and the audio quality reinforces that. Oh, you weren’t convinced about how utterly absurd these headphones were? Here’s the company founder opening up the box with a katana. Because of course he is. The box itself, with its fliptop lid, feels nicely different to most of the boring headphone packages on the market today, and when you open up the full package, it is immediately clear that a lot of thought has gone into the accessories. Chief among these is the carry case. It’s a rigid, zippered, turtle shell design, which feels reassuringly premium. You need to fold up the headphones to fit them inside, once you do, you’ve got yourself a very compact package. For some reason, the case has a carabiner clip on it, which is something we still don’t understand. Yes, maybe you could click these to a backpack while you are on the move, or to a belt, but that feels like it would get annoying very fast. The case also shows some intelligent design, with an interior surface that allows you to attach the Velcro straps that hold the cables in place. And speaking about cables, you get a very nice braided cable to use the headphones in wired mode, with a competent set of in-line controls. There’s also a micro-USB cable for charging. If Sennheiser is a polo-necked German architect, Grado is a skinny-jeans-wearing hipster working at a vegan startup in Brooklyn, and Bowers & Wilkins and Bose are suited executives reclining in first-class on the way to a merger meeting in Singapore, then V-MODA is the most fabulous drag queen you’ve ever seen in your entire life, sashaying down the road at 6AM with a half-full bottle of wine in one hand and a pair of high heels in the other. And you know what? We are here for that. Sometimes, headphone manufacturers badly need to cut loose, and it’s fantastic to see it done in such a confident, competent manner. If you’re a fan of neutral or balanced sound, if you like your headphones to be subtle and discreet, then you can steer well clear of these. You are absolutely not going to enjoy them. But if you want to have a little bit of fun, and you feel like investing in a pair of headphones that will bring you almost constant joy, and which will make you stand out from the crowd, then you should definitely give these a look. They are a very, very long way from the best headphones in the world, but rarely have we had so much fun with a piece of audio equipment. So go on. Embrace the Immortal Life Program. Plug in the V-MICRO cable and unfold the Cliqfold hinges. Get the most eyeball-searing red high-heels you can, and go dancing. Why the hell not? Vast improvement on the original. If you want something a little bit low-key, that costs a little bit less, and offers a good range of features, then you should check out this pair from Philips. They’ve been around for quite some time, and are probably due an update, but we like them all the same. The sound quality is crisp and clear, significantly more balanced than the Crossfade 2 Wireless, even if not quite as much fun. You get aptX Bluetooth standard, too - no rose gold color scheme required. We have reservations about these. We didn’t like the fiddly controls, for one thing. But they’ve sold well, and become firm favorites among the headphone crowd, so we think that they represent a viable alternative. They are quite some way from the frothy confidence of the V-MODAs, and the design is workmanlike at best, so be prepared for that. However, there’s no denying that Sennheiser know what they’re doing, so do check them out if you want something a little bit quieter. Read our in-depth review. These aren’t wireless, but in many ways, they are a direct comparison with the V-MODAs. They lack the latter’s vivacious nurse, but more than match it with the level of elegance and style we’ve come to expect from Romania’s Antonio Meze. The sound quality is just gorgeous, especially when paired with a good headphone amp. We’ve currently got our pair hooked up to a Schiit Magni 3, and it’s a terrific combination. Definitely worth checking out, although you will pay a tiny bit more than the V-MODAs. Read our in-depth review. The wireless headphones market is getting pretty crowded these days. Ever since Apple dropped the stink bomb about removing the headphone jack from the new iPhone models, manufacturers have been falling over themselves to issue Bluetooth headsets.